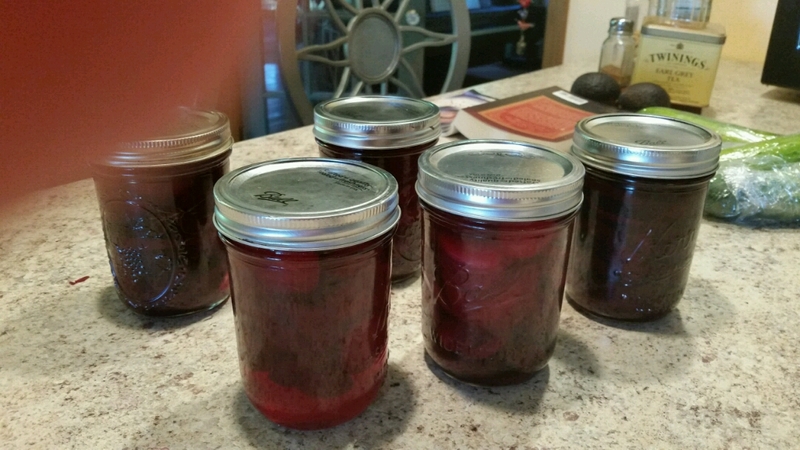 Five jars of pickled beets for the pantry put together by the husband and I. The first one just sealed, a resounding pop that never fails to give me satisfaction. I've been playing around over at Dreamwidth though I've made no entries. I may use it exclusively for my memoirs. Or I may never write there at all. Time will reveal. A busy weekend with daughters, their offspring & friends. Found a roadside stand selling fried catfish Saturday last and was delightfully sur prized to find it quite delicious and inexpensive. All the carrots are harvested now and many of the beets. The green beans are resting and I think will come forth with a few more beans soon. It's quite dry and very hot. The water in the pool is tepid but not overly warm so it makes for a nice float in the late evenings. It's beginning to look as if Moose, Erin and Anah's puppy will be returning to the foster care system. He has taken chasing cars and has a number of other bad habits. It hasn't been a good fit for them. Thank goodness I'm not attached to the dog or I'd be sad about it but it's their business not mine. After watching the tv show "Poldark," I decided to read the series of books , the first of which was written in England in 1945. Thus far I am appreciating the author's writing style and the storyline is similar to the series. Im thinking i will at least finish the first one. Well...I guess I should go clean the beet juice off of things in the kitchen. It's looking a bit red in there. Burgers in a can, now that's weird. Ha ha. It's the beet(root) that comes out of a can. A whole burger out of can? Now that would be something.